Stephanie Kay Journalist Steph studied Journalism at the Queensland University of Technology, graduating in 2012, after growing up in Maryborough. She joined the Chronicle team in 2013. A HERVEY Bay business has taken out one of the Housing Industry Association's top awards. The association praised Bungalow Homes for winning the HIA Queensland Outstanding Showroom Award in Brisbane. A statement from the organisation said Bungalow Homes won despite stiff competition from around the state, following its success at the Wide Bay and Sunshine Coast Housing Awards. The family behind Bungalow Homes, Ross and Angela Scott, said the award was a great recognition of their product. "Our attitude is, people spend a lot of money building a house, we go out of the way in including everything the client wants," Angela said. She said Bungalow Homes focused on more than just building a house, with everything from decor to kitchen cabinets available through them. "Clients are too busy to run around ... so they can come and do everything in one place," Angela said. HIA Wide Bay branch manager Stuart Collins said Bungalow Homes' approach to its new home buildings had won the company the award. 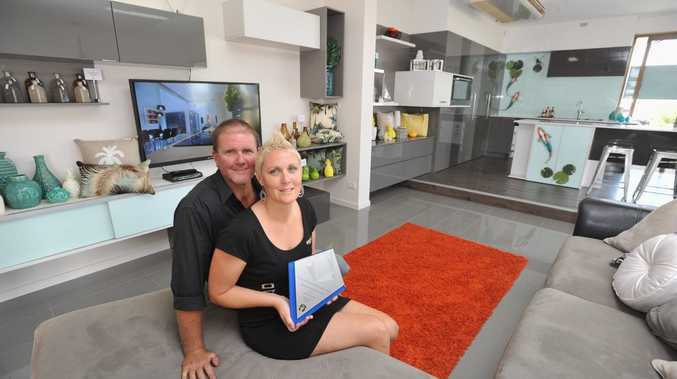 "Bungalow Homes were the only Wide Bay winner of a Queensland housing award at the event," he said.